Last year, the apex of Top Shelf Productions's efforts had to be Alan Moore’s Lost Girls. This year, they’re starting off with four varied and interesting books by Jeff Lemire, Aleksandar Zograf, James Kochalka, and Jeffrey Brown. The Lemire and the Zograf strike me as absolute thoroughbreds, essential reading for anyone interested in the best comics have to offer. The Kochalka and Brown, however, provide significant reading pleasure as well. In this heartfelt and beautifully sparse tale of an orphaned ten-year-old named Lester, Jeff Lemire uses an illustration style that perfectly captures the wide open spaces of rural Ontario. After Lester’s mother dies, he’s sent to live on his uncle’s farm. He hardly knows his uncle and his father has long since left the scene. Lester forms a friendship with a gas station attendant named Jimmy Lebeuf who used to be a professional hockey player until a bad hit knocked him out of the game. Together, the two comics fans build a rich fantasy life revolving around the possibility of an alien invasion. In a watermark grayscale, Lemire also provides flashbacks to both Lebeuf’s career and the details surrounding the death of Lester’s mother. Another section, showing pages from Lester’s own home-made comic book, is imaginative and funny. The book has four parts, corresponding to the four seasons, and beginning with winter. If there wasn’t a word spoken in this understated and genuinely moving tale, readers would still appreciate the strength and off-hand precision of Lemire’s landscapes. From fields to farm equipment to the simple shapes of a gas station, Lemire manages to find the essence of each object and somehow give it an emphasis that makes you see it with fresh eyes. Tales From the Farm often has the same effect as the best black-and-white photography: making you focus in on what matters. Just as there have been multiple accounts of, for example, living through the Khmer Rouge’s reign of terror, accounts of living through the horrors of Yugoslavia’s disintegration and civil war have been ubiquitous over the past few years. Top Shelf’s headline on its press release for this new title -- “Cartoonist Lives Through Bombings By NATO Forces” -- doesn’t help, and is hardly original. Basically, anyone who lived there during that time and is still breathing “lived through” those bombings. So, really, any assessment of this kind of creative nonfiction has to analyze how well the latest iteration either says something new or presents the information in a unique way. I think Zograf succeeds by portraying both macro and micro views of the situation, with his focus always returning to the personal and the absurd. The devil really is in the details, so that a scene in which soldiers civilians think are there to rescue them just steal their radiator has an uncanny surrealism to it. Throughout the book, you find yourself engaging in uncomfortable laughter, because Zograf fully grasps the awful absurdity of the human condition during wartime. Aiding this effort is his bold yet fluid line work and his willingness to include fantastical elements and portents that capture psychological truths about the situation. Zograf is also able to draw realistic scenes and yet include within them strangeness and exaggeration, all while remaining causal and consistent. Most importantly, perhaps, these vignettes, observations, and stories give a more complex and perhaps ultimately more horrific view of the conflict than a documentary. Perhaps this is a simply because there are fewer constraints on a cartoonist. Perhaps it’s because if we were to see video or actual photographs documenting Yugoslavia’s disintegration we would have no distance from the horror. And by horror I mean not just the overarching horror of bloodshed and torment, but the day-to-day stress and the day-to-day struggle of people caught in the crossfire who try to find some way of not only living but of having a normal life of sorts. Regardless, Zograf has done an excellent job of personalizing the experience, but, more importantly, making it universal. Sometimes the sheer accumulation of mundane detail can be compelling -- if that detail veers between the humorous, the surreal, the sad, the silly, the inconclusive. American Elf Vol. 2 collects two years of daily observations by James Kochalka. In the three- or four-panel strip, both Kochalka and his wife are drawn as elves. Whether as a distancing technique or just to be gonzo, it tends to work in making the mundane slightly less familiar. While many of these strips are the kind of slice-of-life observations that can grow tiresome, they’re interspersed with more structured fare, and material that seems to have a kind of coiled Zen koen feeling to it, as Kochalka compresses a lot into a tiny space. Many of the sequences with the baby are particularly hilarious. The flat drawing style with its friendly color palate lends itself to explorations both realistic and more fantastical, as when an intern is drawn as a cyclops. Over the period of 720 days, the linkage between strips becomes stronger and stronger, creating an over-arching storyline that provides a nice counterpoint to the individual strips. Although I was prepared not to like American Elf, I found it hypnotic the more I read, the more I began to live in Kochalka’s world. 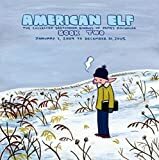 There’s nothing subversive or, ultimately, that profound about American Elf -- maybe that’s part of the point -- but it’s comforting and generous in spirit. Those are both qualities worth seeking out. Jeffrey Brown belongs to the school of deceptively simple artists. His illustrations in these collected vignettes tend to be deliberately primitive, which becomes obvious when he tries something more complex, like the hilarious “Cycloptopus” sequence, featuring a superhero with one eye and tentacles for arms. The extended “Cycloptopus” is side-splittingly funny. Some of the one-page comics suffer by comparison. A deliberately simple illustration style is fine, but it puts more weight on the scenarios and words. In about half the cases, Brown conveys something funny or something slightly profound. But in the rest, the vignettes just fizzle out while the art isn’t interesting enough to get excited about. However, for five bucks, it’s definitely worth seeking out. In the middle of April, I travel to San Diego. Once there, my fellow Eisner Award judges and I will be sequestered in a room until we’ve read any comics we haven’t already read from 2006. Then, we’ll decide on the Eisner finalists. Then, it will be Monday and I’ll be going home. Meanwhile, my wife will probably have had a great time exploring San Diego. On the other hand, I get to read comic books nonstop, with no distractions. Hopefully, I’ll have collected my thoughts sufficiently to discuss the Eisner Awards and the process next time.